Sig Sauer has introduced two new offerings in their Elite Hunting Copper Game ammunition line. 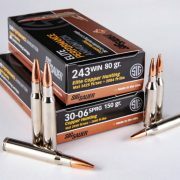 The new 80 grain .243 Winchester and 150 grain .30-06 Springfield bullets are made of all copper. This brings Sig’s Elite Hunting Copper line to seven different calibers, which also include .223 Rem, .300 BLK, 6.5 CM, .308 Win and […] Read More … The post .243 And .30-06 Introduced To SIG SAUER’s Elite Hunting Ammo Line appeared first on The Firearm Blog.